The news broke last week that Google would no longer be showing PPC ads on the right side of search results pages anymore. It’s a big change because it will change the way that the familiar SERP looks, and we haven’t seen an aesthetic change this big in a long time; however marketers are more concerned with how this will affect their advertising. Learn the specifics of the change below and what it will mean to you. Google has been testing this new layout design since 2010 and making small changes ever since, so they are now finally ready to launch the change worldwide to all desktop search results. Now that the ads are removed from the right side of the page they will only appear on the top (4 ads) and/or at the bottom (3 ads) of the pages. In other words, there will now be no more than 7 ads on every SERP. Product Listing Ad (PLA), now called Shopping Campaign, boxes. 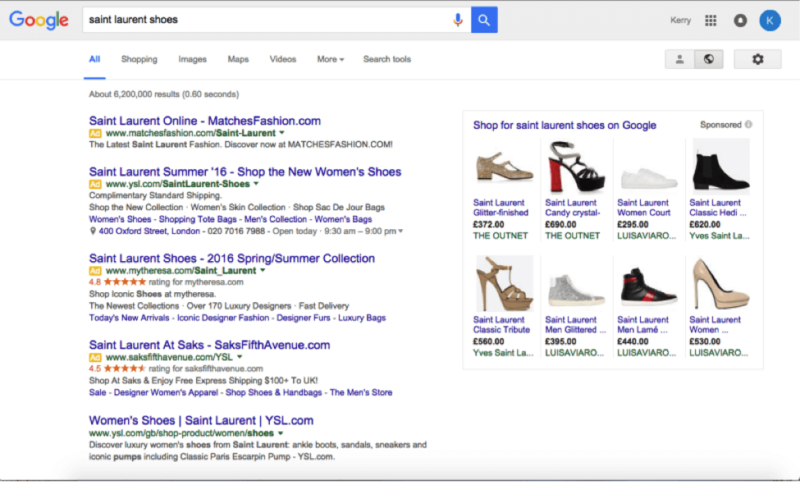 Ads shown in the Knowledge Graph. So Why Did Google Make the Change? Again, they’ve been testing this design for a few years, so although Google hasn’t said exactly why they’re making the change, it could be because this will help make desktop and mobile search results look more similar (although mobile results usually only show two or three ads at the top of the page). This will also help keep the design simple and easy to read for users and help the PLAs and Knowledge Graph stand out. In addition, ads on the right-hand side get clicked at a much lower rate, so it’s best to add more ads to the top of the page. Generally speaking, marketers see a 14X higher CTR than those on the right hand side. 1. You need to update your bid-to-position strategy immediately. Because the position of ads is now different, you’re going to need to adjust your strategy if you’re running a bid-to-position campaign. This will mean potentially paying more for top results (more on this in #3) and testing out whether or not ads at the bottom of the page bring you traffic. As Search Engine Land points out in the same article mentioned above, this alone would cause auction patters to fluctuate for a period of time as advertisers react to one another’s adjustments. 2. You will need to balance your PPC and SEO more than before. While organic search results are said to be more valuable than PPC results because you have to earn them as opposed to pay for them, this new design will put more PPC ads above the fold. This is particularly true when there are commercial results on the page. Now you have four ads above the fold and you still have PLAs on the right-hand side. Check out the following screenshot from Search Engine Land. As they point out, that’s only 8 percent of the page showing organic results. This means that PPC is getting more visible time for many users, which helps us assume that companies should potentially create more of a balance between SEO and PPC. However, this could mean an increase in CPCs, which brings us to our next point. Of course in addition to the things we know above, there is a lot of speculation running around within the SEO community as to what this will mean for factors such as CPC. It stands to reason that we may see an increase in CPC because more marketers will want to pay for the top ads as opposed to the bottom ads. There are now only 7 paid results on the page as opposed to the usual 11, so it makes sense that things will get more expensive and you will have to adjust your budget accordingly. We will hopefully see how these numbers play out after the design has been launched for several months. What do you think of Google’s decision to remove the right hand side ads from their SERPs? How will this affect your bidding strategies? Let us know in the comment section below.